Unveiling Asia Pacific automotive aftermarket trends in terms of the geographical spectrum: India and Vietnam to emerge as bright spots on the industry growth map by 2024 « Global Market Insights, Inc.
Owing to a drastic rise in the demand for state-of-the-art and highly-efficient automotive spare parts, the Asia Pacific (APAC) automotive aftermarket share has been registering commendable progress in the last few years. The eventual wear and tear of existing vehicles is invariably leading car owners to replace the car’s internal components and old spare parts for improved safety and enhancement of the vehicle’s appearance. Moreover, the transformational shifts in global mobility policies across various emerging economies in the region is positively favoring the APAC automotive aftermarket, which is slated to garner more than USD 165 billion in terms of remuneration by the year 2024. Amidst a gradual slowdown in the global economic activity in the recent times, the developing countries in the Asia Pacific terrain are experiencing unprecedented growth. This has facilitated the expansion of the automotive aftermarket across major Asian nations such as China, India, Japan, Singapore, along with smaller economies like Vietnam and Thailand catching up fast enough. The most prominent factor that has been favoring the India automotive aftermarket is the rapidly growing trend of vehicle ownership in rural and semi-urban regions of the country. The statistics published by the Society of Indian Automobile Manufacturers (SIAM) – is the premier organization representing the nation’s automotive industry – are testament to the humongous rise in the sales of passenger and commercial vehicles over the last few years. Recording a y-o-y growth rate of 14.78 percent, the increase in automotive sales has boosted the demand for auto spare parts and other ancillary components across the country, which has, in turn, proved highly-beneficial for the India automotive aftermarket. Speaking along similar lines, the growing adoption of vehicle insurance policies in the nation would further propel the India automotive aftermarket expansion. It is quite prudent to mention that the third-party insurance cover for new cars has been made mandatory for period of three years following a Supreme Court order effective from September 2018. Following the footsteps of major developing economies of the region like India and China, Vietnam is making ground-breaking progress in the APAC automotive aftermarket in the recent years owing to marked uptick in automobile sales and rise in the disposable income of its residents. As per the Industrial Policies Strategies Institute (IPSI) under the Ministry of Trade and Industry, the automobiles production in the nation is expected to increase at an average of 18.5 percent each year over 2018 to 2025, essentially boosting the APAC automotive aftermarket. In line with Vietnam’s ambitious strategy to carve out a profitable growth path for the nation’s automobile industry, the formation of an auto manufacturing center in the vital central economic region is being visualized presently. The proposed Kim Long Motors Hue complex is slated to be set up in the Chan May-Lang Co Economic Zone to not only utilize the port and logistical advantage of the province but also to attract more investors to the local mechanical and spare parts industries in the times to come. Industry analysts believe that the new auto manufacturing complex and the increasing automobile sales would open up unprecedented opportunities for the major firms operating in the APAC automotive aftermarket and position Vietnam as a significant contributor toward the burgeoning automotive industry in the region. In fact, according to a research report put together by Global Market Insights, Inc., Vietnam automotive aftermarket is forecast to expand at an annual growth rate of more than 9 percent over the estimated time frame. 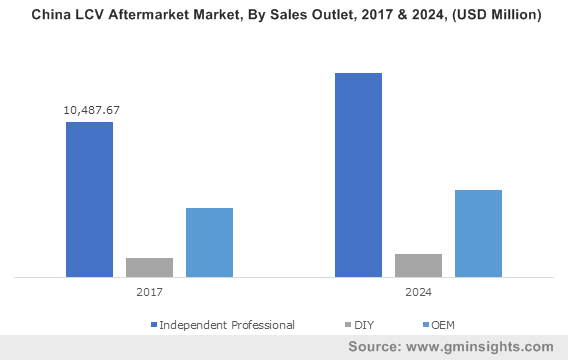 With the dynamically surging demand for advanced modifications in cars in economies such as India, China, and Japan, the commercialization potential of the Asia Pacific automotive aftermarket industry is anticipated to surge majorly over 2018-2024. Powered by the ever-increasing requirement of advanced replacement parts and the dynamic expansion of the regional automotive market, the APAC automotive aftermarket industry is slated to traverse alongside a highly profitable growth path in the years ahead. This entry was posted in Automotive & Transportation and tagged Aftermarket Industry, APAC Automotive Aftermarket, APAC Automotive Aftermarket Size, Asia Pacific Automotive Aftermarket, Asia Pacific Automotive Aftermarket Share, Braking, DIY, Heavy Commercial Vehicle, Independent Professional, Light Commercial Vehicle, Linkages, OEM, Off-Highway Vehicle, Passenger Car, Powertrain Components, Suspensions, Transmission.